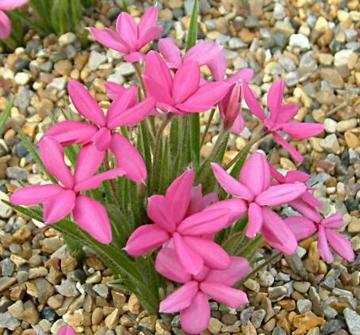 Small clump-forming alpine perennial. Keeled, hairy, greyish-green leaves. Large, magenta pinkish-red flowers, up to 3cm across, produced throughout summer. Well drained moderately fertile, humus-rich, lime-free soil. Water freely when in growth but dislikes excessive winter wet, keep fairly dry. Full sun. Can be container growth and overwintered in an alpine or greenhouse. Divide established clumps or separate offsets, in late autumn. Rock gardens, alpine troughs or containers.